“There is a limit to everything. And with Ukraine, our western partners have crossed the line.” That was President Vladimir Putin’s declaration on March 18, 2014, when he addressed a special assembly of the Russian parliament before the accession of Crimea to the Russian Federation was enacted. 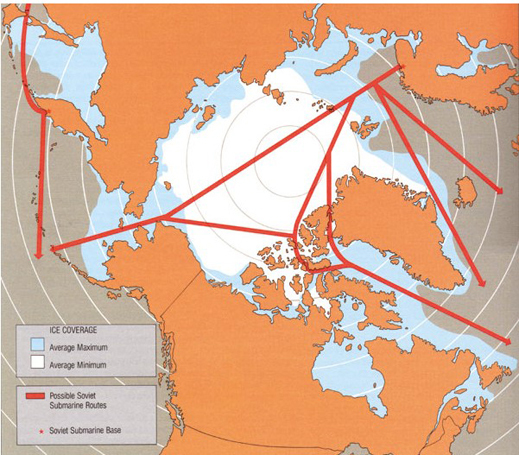 It is likely to be the most consequential line in this century’s history of Russia – the rest of the world, too — because it marked the end of a half-century of peaceful co-existence between Moscow, Berlin, London and Washington; a quarter-century of the end of the Cold War. That’s to say, the limit reached, the line crossed, mark the start of a state of real war. As this year’s celebration of victory over Germany and the end of the war in Europe passes, it’s time to recall how that victory was achieved. Marshal Georgy Zhukov’s ride on the white horse is a symbol to celebrate, but it’s not an answer to the question. 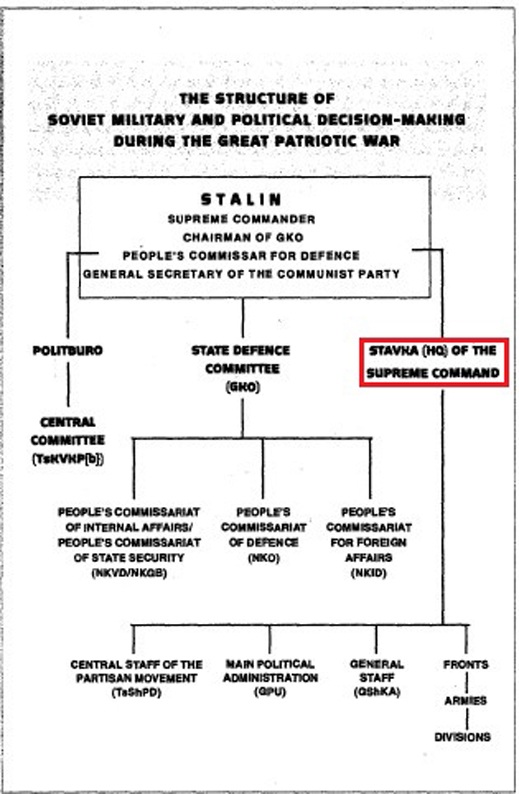 Zhukov was as keen on the personality cult as Stalin. Watch again. The war which started two years ago may be waged with Zhukov’s tenacity and some of his tactics, but command has passed, not to a Zhukov, nor to a Stalin, but to the Stavka. If you don’t know what that was, and is, now is a good time to ask. But the answer is a secret. The war the Stavka wages will be a surprise. For offense to succeed, intelligence on the enemy’s readiness and vulnerabilities must be good. Counter-intelligence, concealment of preparations, deception, maskirovka are also required. The obvious and catastrophic fact is that at the very moment Stalin was proposing to surprise with attack, he was contradicting his own doctrine; rejecting the conclusions of his intelligence services, including military intelligence (GRU), that Germany was about to attack; and refusing to implement the plans proposed by his generals to counter the German attack by moving pre-emptively. Six weeks after his offense speech, on the morning of June 22, 1941, Stalin woke up to Operation Barbarossa, Hitler’s invasion. When Putin announced that “everything has a limit” and “our western partners have crossed the line”, he was acknowledging that he had just had his own Barbarossa wake-up. So far as is publicly known, noone at GRU, the Foreign Intelligence Service (SVR), the Defence Ministry, or the General Staff has been blamed, punished, scapegoated, or shot for the Russian failure to anticipate, deter, or neutralize the US Government’s putsch in Kiev of February 21-22, 2014. 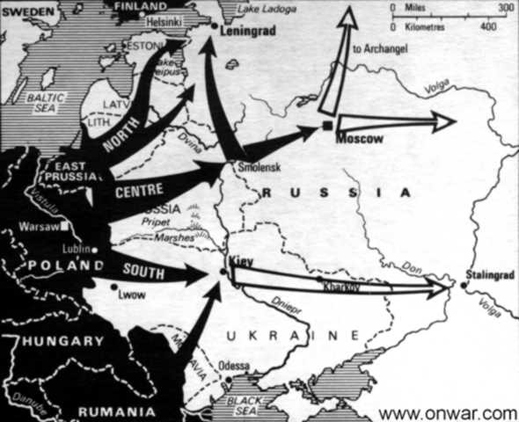 The Crimean move which followed was classic defence by offense – and its swift effectiveness a strategic surprise. Three years earlier, in March 2011, then-President Dmitry Medvedev had had his Barbarossa moment. 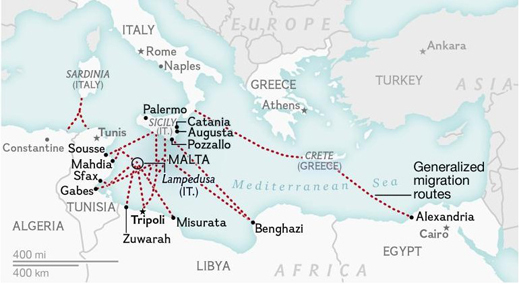 This came after he had ordered the Russian representative at the United Nations Security Council to accept the no-fly zone over Libya which started the US and NATO war against Libya, the assassination of Muammar al-Qaddafi, and the movement of armed forces and flight of large populations to the east, west, south, and north, including Malta and Italy. Study the Zhukov papers, the biographies, the open Soviet archives, and the historians’ debates today, and something is still missing. The record is full of what Zhukov said, did, achieved, based on battle reconstruction maps, personal diaries, and official documents. There is also the testimony of his daughters, his driver, rival generals, jealous politicians. Still, absent from all this is how Zhukov assembled his situation appreciations, what he did with the intelligence and operations reports that came to him, how he made up his mind, changed it, or reflected retrospectively. In short, we don’t know how Zhukov used to think; only what he wanted us to think he thought. The most recent biography, for example, and best in English, Geoffrey Roberts, Stalin’s General: The Life of Georgy Zhukov, fails to mention a single intelligence source or officer on whom Zhukov admitted depending for his operational information. In Harold Shukman’s earlier compilation, Stalin’s Generals, only one of the 26 profiles is of a military intelligence officer, General Filipp Golikov, (right) the GRU chief in 1940-42. Zhukov attacked him mendaciously at the time, and in retrospect. Intelligence gives anticipation and surprise; lack of it, or the failure to understand it, causes surprise. 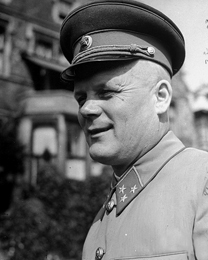 Roberts has opened the Russian military archives for his account of Zhukov. Oddly, he didn’t look at the assessments on the other side – the German military archives. According to this NATO military officer, writing anonymously to protect his pension, there was nothing novel about Zhukov. Surprise “is the essence of the ‘Russian way in warfare’. Know and understand the enemy and surprise him. We have just seen this again in Syria. And, for that matter, over and over again in the Ukraine crisis where nothing has gone the way Nuland & Co intended. And in Ossetia in 2008.” For more examples from the same military assessor of why Russian tactics usually won NATO war games, read this. So, Zhukov had his predecessors. Also, he has his aspiring successors. Officially, there is no Stavka today. The Security Council, which convenes roughly every week with the defence minister in attendance but no military officers, is not the Stavka. 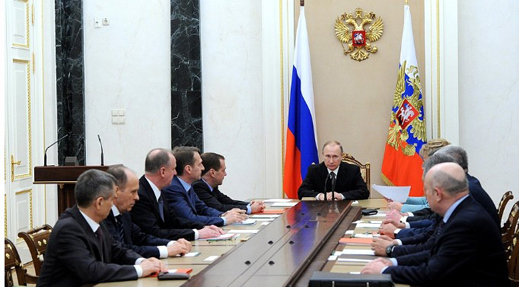 Latest official meeting of the Security Council, April 26, 2016:To Putin’s right is Prime Minister Medvedev; to his left, Federation Council Speaker, Valentina Matviyenko. If command by surprise is the strategy, employing the standing forces required can be very expensive. One way to keep surprise but cut costs is to let the enemy know that there are red lines, and if he threatens to cross them, he will be attacked, without further warning. Krutikov was writing in March 2014. In the two years since, Syria — a sideshow in his assessment then — is now a war front stretching across the border with Turkey to include Turkish operations under NATO cover at bases like Incirlik. In due course, it will be clear whether the US-Turkish attempt to install a NATO base in northern Cyprus has become an extension of the front. There are a couple of riders to the Zhukov guide to aspiring Russian soldier strategists. One concerns the self-serving vanity to which Zhukov was prone, as have been some of his post-Soviet successors in command. Don’t expect to keep your reputation intact, among your peers or the public, if you try getting away with the Zhukov haul from Germany — 70 pieces of gold jewellery, 740 items of silverware, 50 rugs, 60 pictures, 3,700 metres of silk, 320 furs, foreign antiques, and 20 British and German hunting guns. Under investigation by a party commission, Zhukov claimed he had bought the loot with his own money, or been given them as war trophy gifts. Noone believed that. The second rider is that the Stavka is a collective, whose members must remain anonymous, and avoid riding white horses in public. 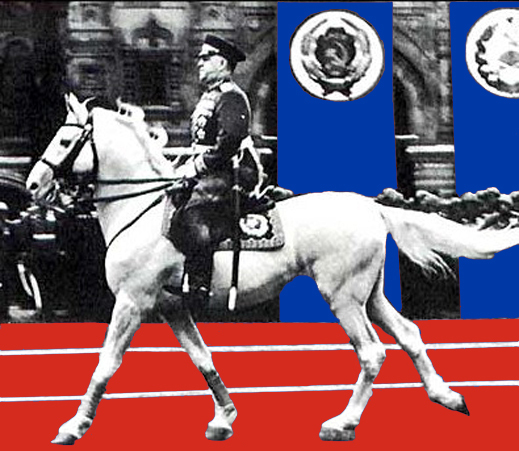 Stalin, according to a claim by his disaffected son Vasily, planned to ride the stallion in the 1945 parade, but he fell off in a rehearsal on Khodinka Field. 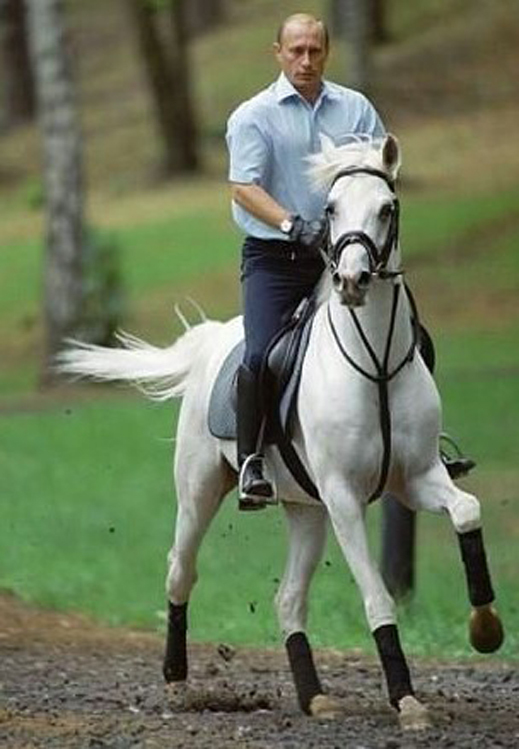 In the saddle Putin is more stable. If it is, it’s a military secret.